A group met at the home of Benjamin Franklin and created the world's first "penitentiary." In the ambitious age of reform following the American Revolution, the new nation aspired to change profoundly its public institutions, and to set an example for the world in social development. Every type of institution that we are familiar with today — educational, medical and governmental — was revolutionized in these years by the rational and humanistic principles of the Enlightenment. Of all of the radical innovations born in this era, American democracy was, of course, the most influential. The second major intellectual export was prison design and reform. Most eighteenth century prisons were simply large holding pens. Groups of adults and children, men and women, and petty thieves and murderers, sorted out their own affairs behind locked doors. Physical punishment and mutilation were common, and abuse of the prisoners by the guards and overseers was assumed. It's worth noting however, that while good-intentioned, the Quaker philosophy was an abysmal failure when applied to penology. Prisoners kept in isolation for long periods of time do not become penitent and reflective, transforming into productive members of soicety. More often than not, they go insane. Today, solitary confinement is used strictly as a punishment within prisons, and most prisoners will adopt more socially-acceptable behavior to avoid this maddening treatment. Eastern's seven earliest cell blocks may represent the first modern building in the United States. The concept plan, by the British-born architect John Haviland, reveals the purity of the vision. Seven cell blocks radiate from a central surveillance rotunda. Haviland's ambitious mechanical innovations placed each prisoner had his or her own private cell, centrally heated, with running water, a flush toilet, and a skylight. Adjacent to the cell was a private outdoor exercise yard contained by a ten-foot wall. This was in an age when the White House, with its new occupant Andrew Jackson, had no running water and was heated with coal-burning stoves. Virtually all prisons designed in the nineteenth century, world wide, were based on one of two systems: New York State's Auburn System, and the Pennsylvania System embodied in the Eastern State Penitentiary. During the century following Eastern's construction, more than 300 prisons in South America, Europe, Russia, China, Japan, and across the British Empire were based on its plan. "Thrown into solitude... [the prisoner] reflects. Placed alone, in view of his crime, he learns to hate it; and if his soul be not yet surfeited with crime, and thus have lost all taste for any thing better, it is in solitude, where remorse will come to assail him.... Can there be a combination more powerful for reformation than that of a prison which hands over the prisoner to all the trials of solitude, leads him through reflection to remorse, through religion to hope; makes him industrious by the burden of idleness.."
Charles Dickens did not agree. He recounts his 1842 visit to Eastern State Penitentiary Chapter Seven in his travel journal, American Notes for General Circulation. The chapter is titled "Philadelphia and its Solitary Prison:"
"In its intention I am well convinced that it is kind, humane, and meant for reformation; but I am persuaded that those who designed this system of Prison Discipline, and those benevolent gentleman who carry it into execution, do not know what it is that they are doing....I hold this slow and daily tampering with the mysteries of the brain to be immeasurably worse than any torture of the body; and because its ghastly signs and tokens are not so palpable to the eye,... and it extorts few cries that human ears can hear; therefore I the more denounce it, as a secret punishment in which slumbering humanity is not roused up to stay." The system of solitary confinement at Eastern State did not so much collapse as erode away over the decades. Indeed, the critics eventually prevailed, and The Pennsylvania System was officially abandoned in 1913. Some of America's most notorious criminals were held in Eastern's cells. When gangster Al Capone found himself in front of a judge for the first time in 1929, he was sentenced to one year in prison. He spent most of that sentence in relative comfort at Eastern State, where he was allowed to furnish his cell with antiques, rugs, and oil paintings. Bank robber Willie Sutton joined eleven other men in a doomed 1945 tunnel escape. After the last prisoners left Eastern State Penitentiary in 1971, the prison stood for over twenty years with absolutely no maintenance. By the time our tour program began in 1994, the buildings were in a terrible state of deterioration. The deterioration was so severe that the Penitentiary was labeled a semi-ruin. People always ask if we plan to restore the whole prison. We do not. For one thing, it is cost prohibitive. More importantly, we and our visitors like the decay. Instead, our goal is a stabilized ruin, to stop the deterioration and to make the tour route safe for our visitors. We also plan to restore some places, places that help visitors better understand how the building was designed and how it changed over time. Charles Dickens wrote about the treatment here, that it is "worse than any torture of the body." The word "penitentiary" was coined here, by the belief that criminals would become genuinely penitent. The last inmate left in 1971. 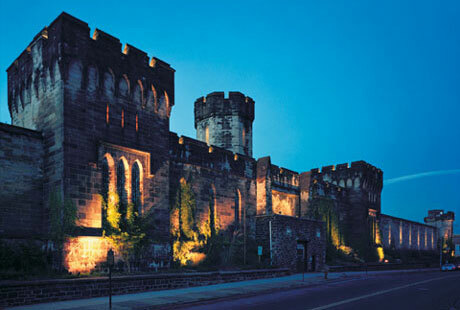 In 1931, the Pennsylvania System of confinement with solitude is officially abandoned at Eastern State. Over a hundred inmates escaped. Only Leo Callahan (who escaped in 1923) was never recaptured. Opened: October 23, 1829. The first inmate was a burglar named Charles Williams, who stole a watch and several other items. Samuel R. Wood was the first Warden. 1831: The first female inmate. Location: 22nd St. and Fairmount Ave., five blocks from the Philadelphia Museum of Art. Note: this is not walking distance from the Historic District.